The Cora Hartshorn Arboretum is a historic woodlands garden and educational institution. Our mission is to foster and promote environmental awareness, education, and stewardship within the greater community. 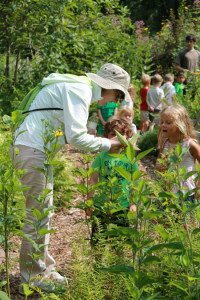 Our environmental education programs are designed to provide children of all ages opportunities to develop a sense of place with our region’s natural areas and acquire the knowledge, attitude, and skills needed to become the future stewards of the environment. Our 16-acre forest was once a degraded woodland that is now a demonstration project that seeks to move us toward our goal of restoring and sustaining a healthy, diverse woodland habitat where native trees, other plants, and native animals can flourish. We want you to have the opportunity to step into a scientist's shoes for a hands-on experience in conservation science. Through our FrogWatch and salamander monitoring citizen science projects, you’ll get the chance to collect valuable data that will help scientists gauge and plan for future conservation needs. Our volunteer program encompasses a range of activities for all ages and abilities to help nurture a lifelong love of learning and dedication to our local environment. Our volunteers take pride in the work they are doing while helping connect visitors with nature.